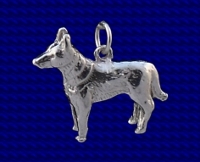 Sterling silver Alsation charm. The Alsation or German Shepherd dog is a fairly new breed, being bred in Germany in the late 1890's as a sheep dog. It was found to have characteristics that also made it suitable as a guard dog, police dog and also for use in military situations, it has since become a very popular breed. Craftsman made Sterling silver Alsation charm. Approx. size 19mm x 22mm.